This guide will walk you through creating an EMDK For Android application that will use some new Mx features introduced in EMDK for Android API to perform device configurations. Mx represents a suite of Enterprise Features on top of standard, commercially available Android Open Source Project. So this tutorial will focus on installing certificates on your Symbol device using Certificate Manager. You can use these installed digital certificates to identify your device for a variety of purposes, including VPN or Wi-Fi network access as well as authentication to servers by apps such as Email or Chrome. Let us create a tutorial using Certificate Manager and install a sample CA certificate that would be useful when using WiFiConfig to configure a profile that uses EAP-TLS while adding a Wi-Fi network. We can install different types of certificates (Ex. .PEM, .PFX, .P12 etc. ) 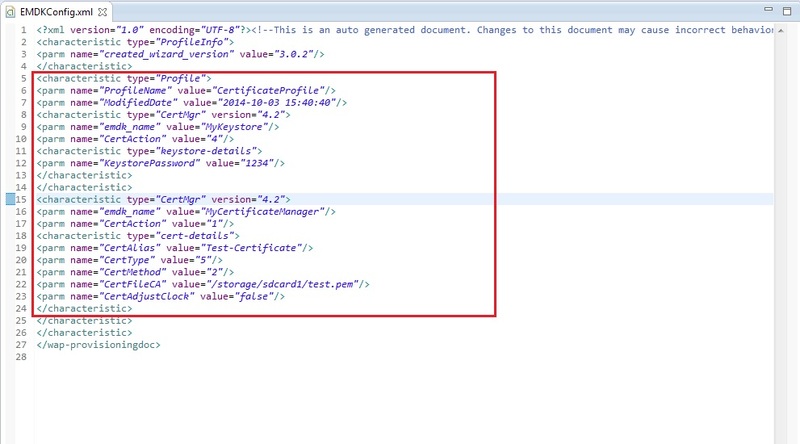 but for this tutorial, we will install a sample CA certificate (.PEM file). Note: Provide "CertManagerTutorial" as the project name for this tutorial. 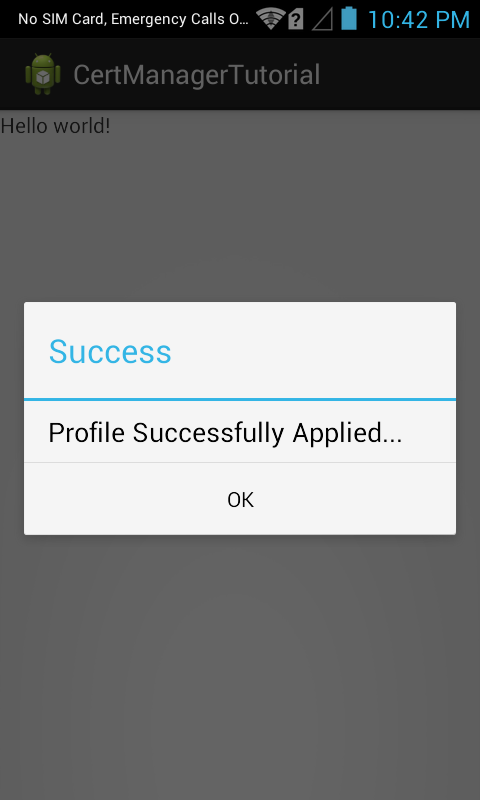 Provide "CertificateProfile" as the Profile Name for this tutorial. Now, you can see all these MX features on the left hand side of the Profile Editor window. Select the "Certificate Manager" feature from the list and click "Right Arrow". Now, We have to add the feature to install our sample CA certificate on Symbol device. But, we need to make sure that before installing or uninstalling certificates, a keystore must exist. 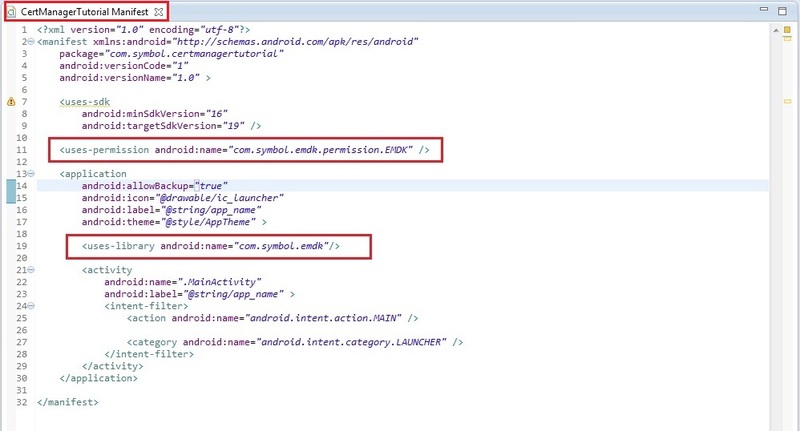 It means, we need to initialize Android Keystore on our Symbol device. When you initialize the Android keystore you create a new keystore replacing any previously existing one. 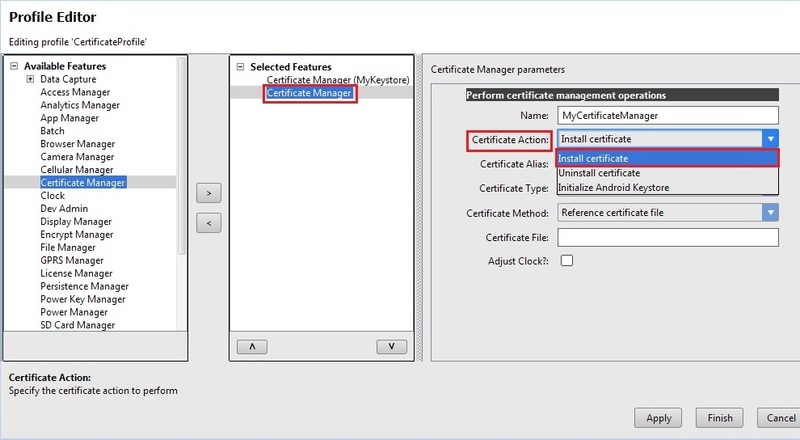 You can choose to perform this action as a separate EMDK profile or include the Certificate Manager feature multiple times in one profile. 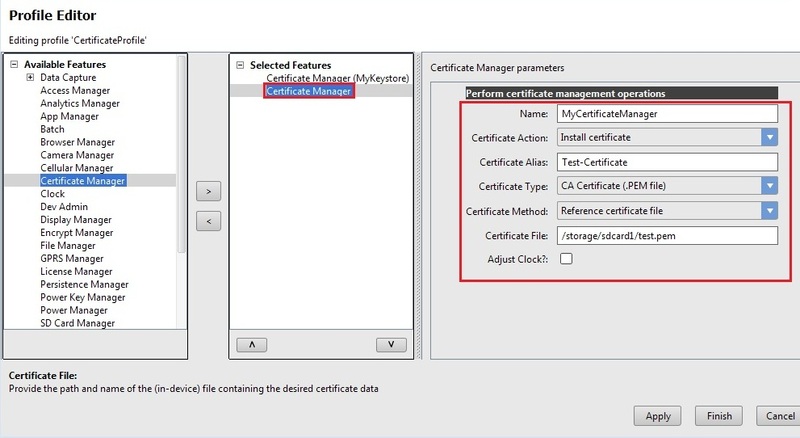 We will use Certificate Manager feature multiple times with the same profile in this tutorial. 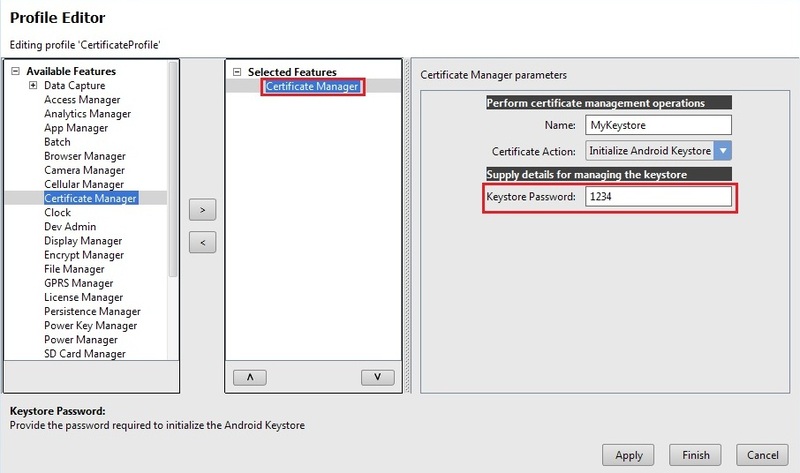 This Certificate Manager feature will be used to initialize Android Keystore. Provide some name in the "Name" field (Ex. "MyKeystore"). The "Name" field is used to identify each feature, which is required when editing features programmatically. You can also keep the "Name" field empty. Click the "Certificate Action" drop-down and select "Initialize Android Keystore" option. Provide the password required to initialize the Android Keystore in "Keystore Password" field (Ex. 1234). As mentioned, we will add another Certificate Manager feature in the same profile to install our sample CA Certificate on Symbol device. Select the "Certificate Manager" feature from the list and click "Right Arrow". This Certificate Manager will be use to install CA Certificate on Symbol device. Provide some name in the "Name" field (Ex. MyCertificateManager). The "Name" field is used to identify each feature, which is required when editing features programmatically. You can also keep the "Name" field empty. 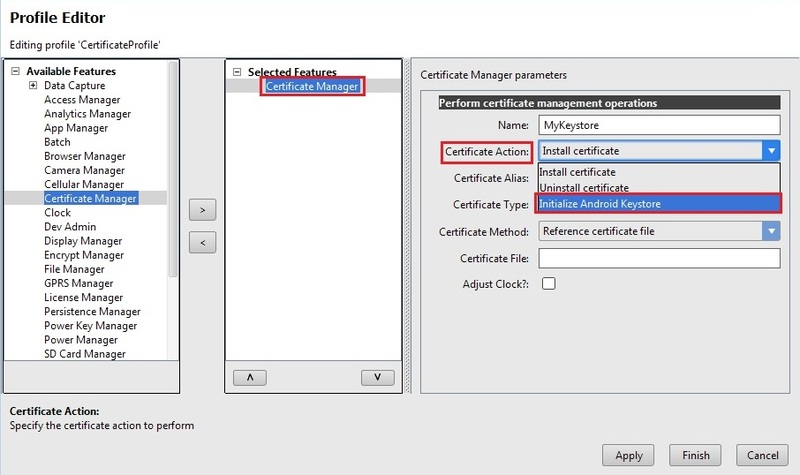 So as discussed, you can install different types of certificates (.PEM, .PFX, .P12 etc. ) on your Symbol device using Certificate Manager. 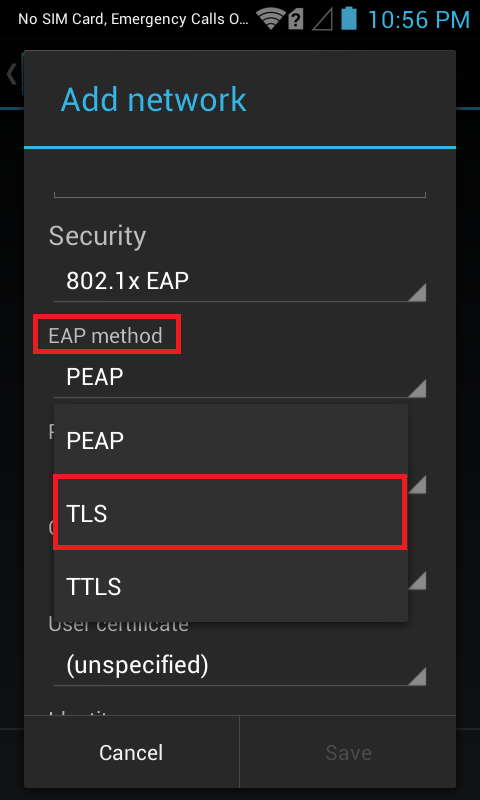 Here, we will install a sample CA certificate (.PEM file) that would be useful when using WiFiConfig to configure a profile that uses EAP-TLS while adding a Wi-Fi network. Click on "Certificate Action" drop-down in the wizard and select the option "Install Certificate". To uninstall any installed certificate, select "Uninstall Certificate" option from "Certificate Action" drop-down and provide the appropriate alias name of certificate you want to uninstall. 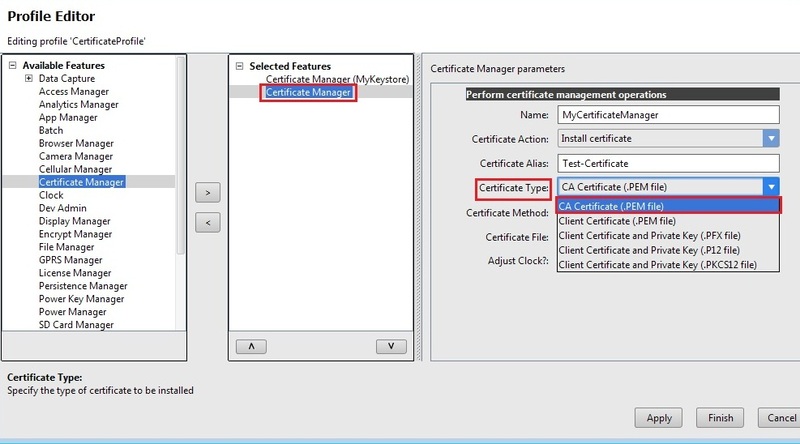 Provide some name in "Certificate Alias" field to refer your certificate while performing different actions on it such as uninstall (Ex. Test-Certificate). 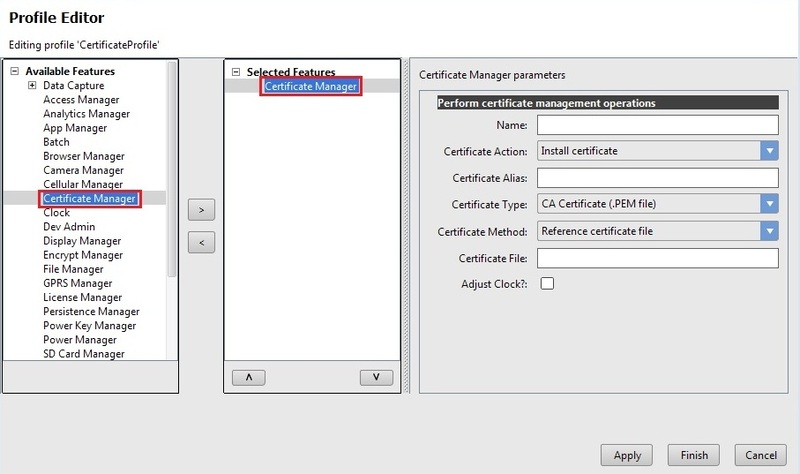 Click on "Certificate Type" drop-down in the wizard and select the option "CA Certificate (.PEM file)". Provide the SD Card path of the Sample CA Certificate that we put in the beginning (/storage/sdcard1/test.pem). Note: SD Card Path may vary based on where you put your certificate. 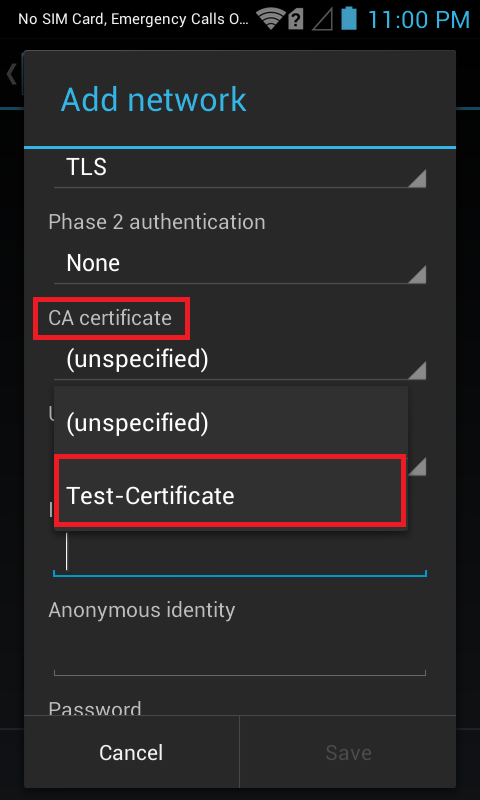 Note: As you can see, we have added two Certificate Manager features in the same profile to Initialize Android Keystore and Install sample CA Certificate respectively on the Symbol device. 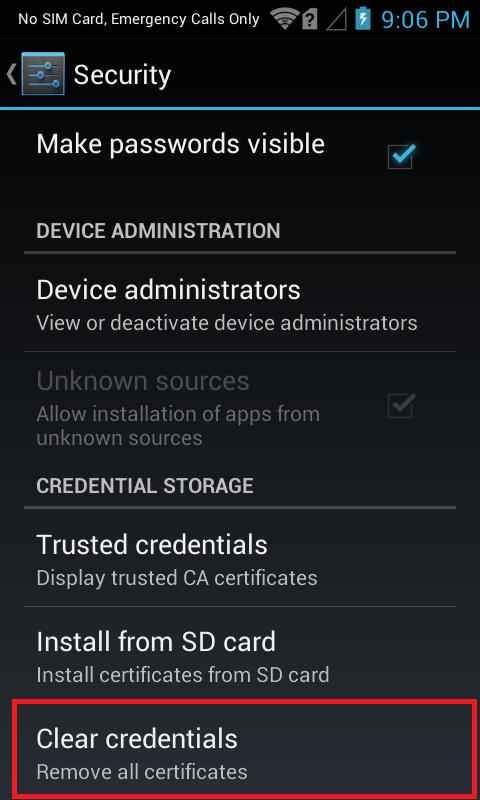 Click Finish and your Certificate profile for initializing Android Keystore and installing CA Certificate is created. That's it!!! We are done with all the coding and configuration part that will let us install the sample CA certificate on Symbol Android device. Now let us run the application. Note: If "Clear Credentials" option is disabled, you don't need to clear it. You can see an Alert Dialog with a success message, which indicates that the sample CA certificate with alias name "Test-Certificate" has been installed. 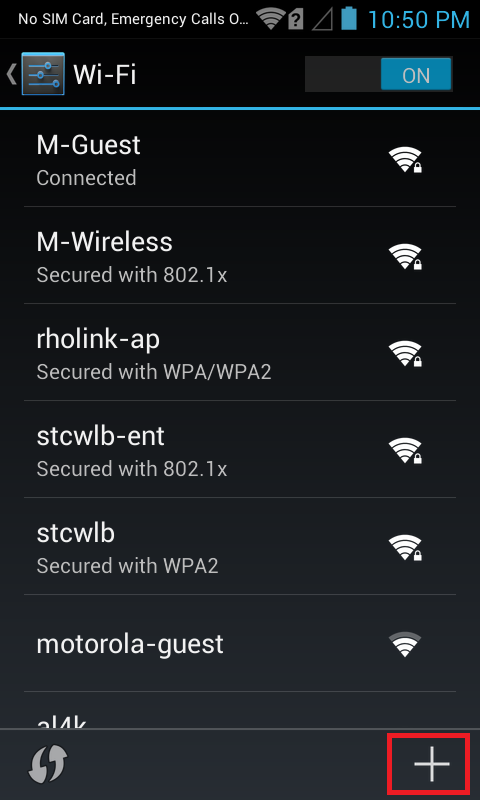 Press "+" button to add a Wi-Fi network. 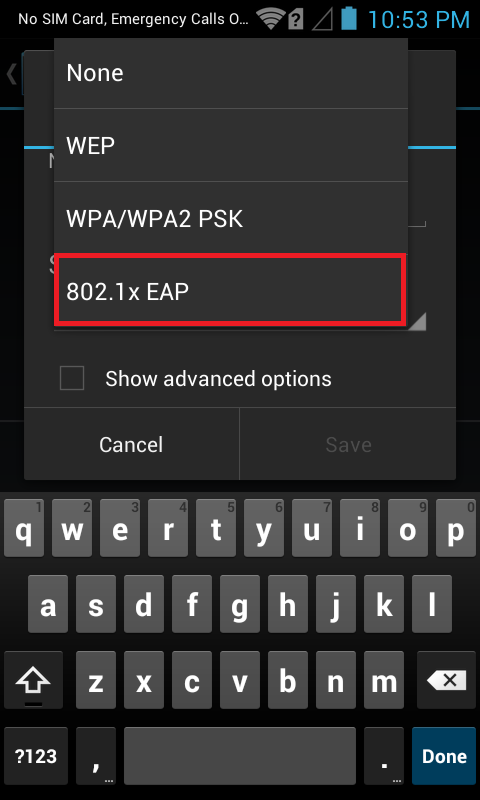 Tap the "Security" drop-down and select "802.1x EAP" option. Now scroll down and tap on "EAP method" drop-down. Select "TLS" option. 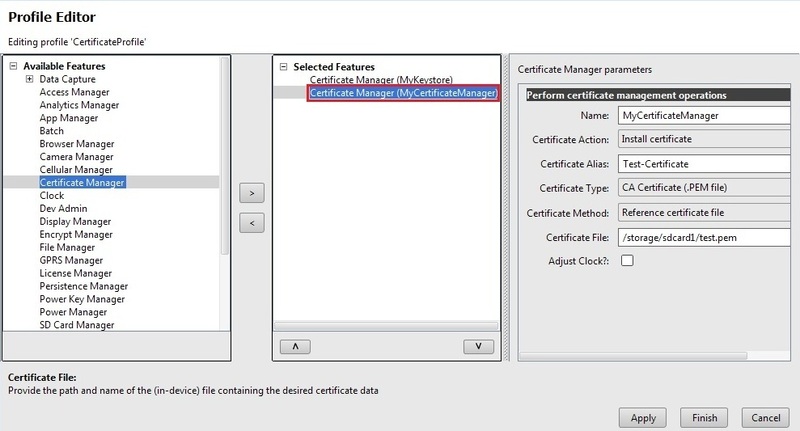 Scroll down and tap on "CA Certificate" option and you should see the alias name (Test-Certificate) of the Sample CA certificate that we installed using Profile wizard. The alias listed can become the value to use as the certificate when using Wi-Fi Config to configure a profile that uses EAP-TLS. You can also uninstall the installed certificates through Profile Manager wizard by simply selecting "Uninstall Certificate" option in the "Certificate Action" and proceed. 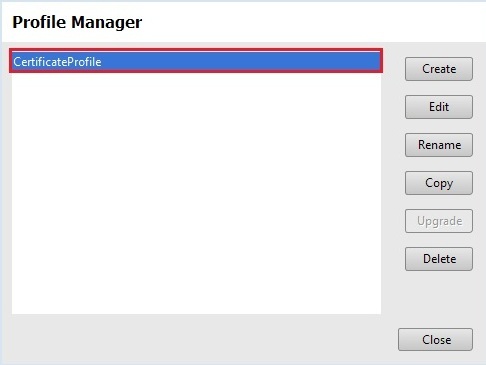 This is how Certificate Manager lets us configure different types of certificate on the Symbol Android device using Profile Wizard. Now that you have learned how to configure various types of certificates using Certificate Manager on your Symbol devices through applications, let us try to understand and implement some of the other new Mx features introduced in V 3.0. So in the next tutorial, we will concentrate on the "XML Manager" Mx feature and try to explore this feature by creating a tutorial.